Tagged under Kouhaku Kuroboshi, A.C.G.T., Light Novel, Series. 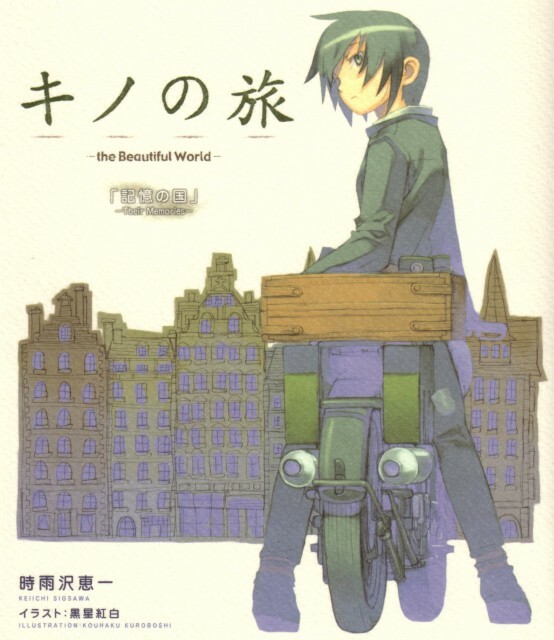 Kino no Tabi (Kino's Travels, Kino's Journey) follows two travelers, the human Kino and the motorrad (a type of motorcycle) Hermes. Each episode (except for the two Coliseum episodes) takes you to a different country (often more than one) where the two experience life in a different place, surrounded by different cultures and ideologies. Like the viewer, Kino is an observer and rarely passes judgement on the people or places she meets, but the situations are often compelling (or disturbing) enough to possibly change ones' world view. Kino no Tabi originally started out as a novel series (currently 13 books) before being made into an anime (13 episode TV series, preceeded by 1 OVA short for promotional purposes) Later, based on the popularity of the novels in Japan, two 30-minute movies were produced. Kino no Tabi is different from your average anime series, and certainly won't please everyone. The variety of stories it presents from the various countries Kino and Hermes visits are at times cliche, at times highly disturbing, or at times rather bizarre. There are a few moments of humor, but they're more in the realm of satire than "haha funny" comedy. Also, some of the concepts are mature in nature and this definately isn't a kiddie show. However, the sum of the parts is far greater than if each element was taken separately. A single episode taken alone may not be original, but if you take the series as a whole, it's certainly quite different from what's been done before. A work of art as for the philosophical and poetical point of view. It's quite evident the influence of Zen and Shinto in the way of contemplating the world (which itself is a very important statement: to contemplate is to observe attently, to understand what you are watching). The fact that Kino doesn't get too involve is that she tries no to attach herself to nothing 'cause in the end, everything changes and may well vanish. What I like is how she transform her own reality according to her dreams. She inherits a new name, she learn how to travel, she learns how to fight, she even switch her female register to a male one but she do not deny or hide her woman condition. That's how I feel it. rather deep in content - discussed various issues when taken to extreme. love this concept. characters ok but very cool. love the idea that motobike can talk. overall tone of anime set in greyish color. very different from mainstream. 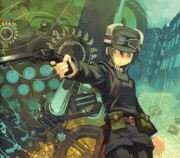 For me, Kino no Tabi is one of the magnificent anime I've ever seen. It's actually a serious series, you won't find much things to smile upon. But still, like I've said before, it's a magnificent story, very captivating, from the very first second you watch. Excellent anime... I'm a huge fan of dystopian literature, so this series really appeals to me. I absolutely love the different countries and the moral/ethical questions that arise. Main premise is very similar to The Little Prince. (Which I have yet to read.) I'm very disappointed in TokyoPop for losing the license to this series. I feel that the novels would have brought more meaning to the anime series. Kino no Tabi is definitely not your average type of anime. Before I got a hold of my own copy, I had thought that it would have a simple plot as any anime I've watched, and that's where I was gravely wrong. This series won't foster feelings of contentment and sheer enjoyment in its viewers; instead it will leave you haunted with the implications of its dire and intriguing concepts. Each episode has its own unique theme that, quite ironically, presents aspects of reality which are often the cruel ones. For example, two countries assassinating innocent citizens in a separate town simply to avoid war between them is utterly repulsive. The whole series travels on a similar note, so if you do not prefer dire themes, it won't be a surprise if you would not appreciate it at first. But give it a try; sometimes, anime is not only meant for fun, but also to knock some sense into our typically senseless reality. And Kino does just that. Kino no Tabi is an extraordinary one. Each episode has its own (stand-alone) storyline that will bring the watcher into deep contemplation. Deep, lingering impression of wandering, was left (in my brain), even after years have passed. A philosophical show that explores why humankind is so irrational. Some people won't like each episode (with one exception) being standalone stories linked together only by the two protagonists, but I don't think this type of show could have been done any other way. Wonderful, very introspective series. Kino is an excellent character, very, very badass. Hermes rocks, too. Music is great. Art is simple, but beautiful, and adds a fable-like quality to it that I love. Novels were unfortunately butchered when they were translated. Great for rewatching. I'm depressed that I never got to meet the talking dog and that other guy. Simply beautiful story, Kino's the best character ever. I just love the way she experiences everything in her travels without judging if it's good or bad, right or wrong, she might not agree with it, but she respects the way of life of other people, and that's a hard thing to do, we're so bound to what we learn is the rigth or good thing that we tend to be tolerant but not respectful of others who are different from us, so I think it's a very good anime.